Recent revelations that a substantial number of consultant jobs within the HSE are staffed by doctors who lack specialist training have provoked significant public outcry. Legitimate patient safety concerns have been raised. The HSE itself has expressed concerns and admitted this should not be happening. Patients deserve to know that the most senior doctor overseeing their care is appropriately qualified as a specialist in their field. The concerns are all too familiar to the members of the Irish Association of Plastic Surgeons (IAPS), which has been trying for years to highlight the issue of non-specialist doctors performing cosmetic/aesthetic surgical procedures in non-accredited facilities. There is a shocking lack of regulation of this sector. Patients often believe that their procedure is being carried out by a doctor who has completed specialist training, when in fact this is not the case. These clinics will often appear in internet searches, promoting deals or offers. This is a very real problem that is being fuelled by confusing and overlapping terminology; little to no regulation; sharp practice; and deliberate attempts by certain clinics to mislead patients into believing they are being treated by specialists. On average, an IAPS plastic surgeon will have completed 12 to 14 years of further training after graduating from medical school. This includes an intensive six-year higher surgical training programme in the speciality of plastic reconstructive and aesthetic surgery, rigorous professional examinations, and subspecialty fellowship training at the end of that time, before becoming specialist consultants. The discipline of plastic reconstructive and aesthetic surgery, governed by the Royal College of Surgeons of Ireland (RCSI), is the only training programme that trains surgeons in aesthetic (cosmetic) surgery in Ireland. Unfortunately, when it comes to aesthetic procedures, confusion exists among members of the public as to what constitutes a plastic surgeon who has qualified with the necessary specialist training. A fully accredited plastic reconstructive and aesthetic surgeon who is qualified and trained will have completed their training in this specialty. They will also have passed the fellowship exam, denoted by FRCS Plast after their name. Unfortunately, any doctor with a basic medical degree can call themselves a “cosmetic surgeon” an “aesthetic surgeon” or a “cosmetic doctor”, and more and more practitioners are using this self-coined and meaningless term. In reality, there are no such recognised terms. Such doctors commonly perform surgical procedures that require years of specialist training, often with suboptimal outcomes. Every member of IAPS has seen patients who have been misinformed, mistreated or misled by someone professing to have expertise in a surgical area when they do not. The Irish public are very aware of the PIP breast implant problem which occurred a number of years ago. We are still sorting out the mess that these implants have caused, removing sticky silicone from breasts. One of the main non-accredited clinics which used PIP implants disappeared soon after. It left patients with no information accessible to them regarding their now flagged dangerous implants. We are witnessing a constant stream of patients who are forced to seek corrective surgery, or left with permanent and visible scars. Many are gobsmacked to learn they have not been treated by specialist plastic surgeons and at the lack of regulation and protection afforded to them. A patient had breast implants and her wound reopened. She was told by the clinic to pull out her breast implant at home and attend the clinic when they reopened. Inappropriate laser treatment was applied to what was an obvious skin cancer on the patient’s nose. Cases such as this where no formal histology is obtained can potentially have disastrous consequences. A patient had cosmetic fillers that hardened into lumps around her face and across her forehead. These had to be surgically removed, leaving her with permanent scars over her face. The International Society of Aesthetic Plastic Surgery, (ISAPS) coined the concept of the “safety diamond” to protect patients – a suitable patient, an accurate medical history taken, a suitably accredited environment that can cater to emergency needs, and a suitably qualified surgeon. The term ‘specialist’ is supposed to be reserved for doctors enrolled on the specialist division of the register in a recognised specialty, but is commonly misused. We routinely see some plastic surgery clinics claiming their doctors are specialists in their given field, yet they do not hold specialist registration. We have also seen a false distinction drawn between plastic surgery and cosmetic surgery, as well as the claim that cosmetic surgery and aesthetic medicine training are obtained separately from plastic surgery training. This is false. Cosmetic procedures are an integral part of our specialty, and the only pathway that qualifies doctors to perform these procedures is the higher surgical training in plastic reconstructive and aesthetic surgery, as outlined above. Aesthetic medicine training is similarly integrated into plastic surgery training, as well as into specialist training in dermatology. Our consultant dermatologist colleagues recently communicated their concerns in this regard, and we share their concerns. At present the healthcare regulator Hiqa has no jurisdiction over these private cosmetic clinics meaning they can operate with impunity. The Department of Health has been working on legislation to license private facilities since 2008. It is unclear what has caused the delay, but our concerns appear to be falling on deaf ears. What exactly will it take for the Minister for Health and his department to act? 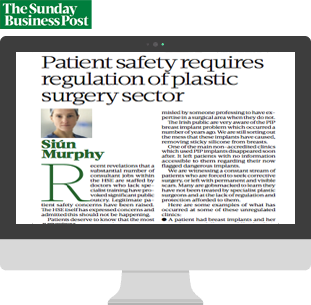 Siún Murphy is a consultant plastic surgeon.